*Special, heart-felt THANKS to Matt Ellis & Vavine Tahapehi, for helping me to create this Local Venice Hang-Out Since 2009. I truly could not (as you know) have done it without you. Deep LOVE and FRIENDSHIP always. 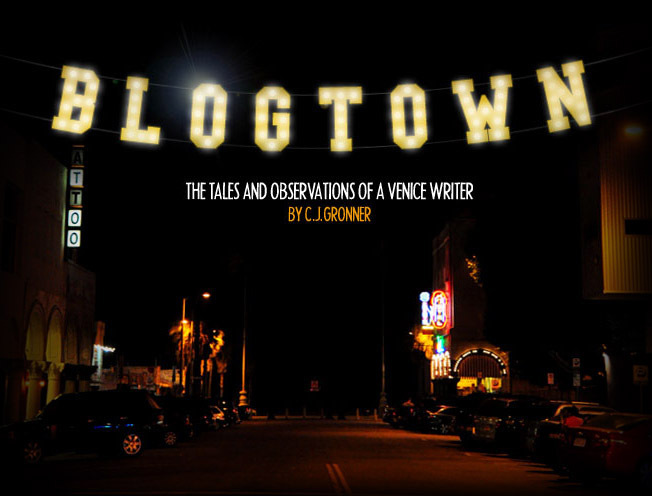 9.9.9. the birth of such a wonderful creation 'Blogtown' ! I wish you an abundance of warmth, love and support. I wish you many bike rides with amigos around round-abouts in Venice. I wish you many more beach birthday gatherings, store front music beats, and quaffable elixers of goodness. I wish you many random inexplicable moments of meeting more inspiring people and passionate souls. I wish you a orange hibiscus in full bloom all year! Enjoy and write about the hive of upcoming activities and events. A radical recipe for bannana bread and more baking tasty triumphs. The secret ingrediant: L.O.V.E!!!!! Cheers C.J I am looking forward to being in the know and where to go, what to eat and where to drink, the spot to dance and find romance, take a stroll and and smoke a bowl !!!!!! ONE LOVE!!!!! Hello CJ, It was wonderful to see you and Stephanie tonight. Thanks for reminding me to join your blog. Sometimes we all just need a little push to get into new things. Venice and the westside of LA is such an easy place to relax and hit the cruise control button on life. So thank you for getting me to switch to manual for a change. Tortilla Grill Mourners - Get Stoked! Abbot Kinney Street Festival 2009! Ben Harper at the West Beach Festival! "Mercury is in retrograde, everyone needs a hat!"